What are the misspellings for Mae? 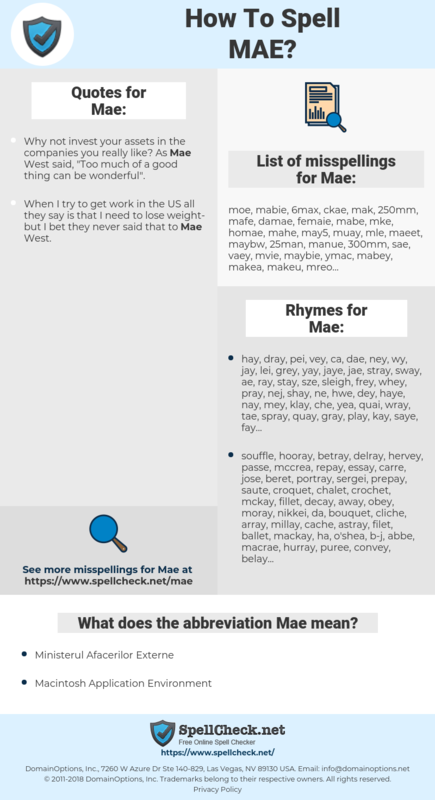 What are the common mistypes for Mae? What does the abbreviation Mae mean? What are the quotes for Mae? What are the rhymes for Mae? 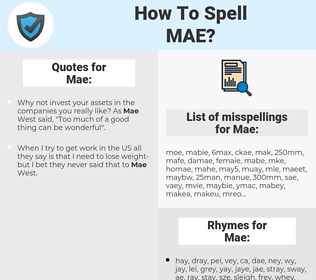 What are the common typos for Mae? Mae as a girl's name is a variant of May (English), and the meaning of Mae is "the fifth month". This graph shows how "Mae" have occurred between 1800 and 2008 in a corpus of English books. When I try to get work in the US all they say is that I need to lose weight- but I bet they never said that to Mae West. And so Fannie Mae produces very strong results for investors in- when interest rates are high and when interest rates are low, in recession and during booms.